A middle aged male with h.o. RTA. Now present with right side Facial nerve palsy and Deafness. CT study shows non depressed fracture involving occipital bone extending anteriorly to involve petrous bone. The fracture line is running transverse to petrous axis, involving internal auditory canal and vestibule appears to be the cause of patient's right side facial nerve palsy and sensory neural hearing loss. Temporal bone fracture is encountered in 75% of all skull base fractures. There are 3 subtypes of temporal fractures are longitudinal, transverse, and mixed. A. Longitudinal fractures occurs in the temporo parietal region and involves the squamous portion of temporal bone, superior wall of the external auditory canal, and the tegmen tympani. These fractures may run either anterior or posterior to the cochlea and labyrinthine capsule, ending in the middle cranial fossa near the foramen spinosum or in the mastoid air cells, respectively. Longitudinal fracture is the most common of the 3 subtypes (70-90%) and associated with conductive deafness due to ossicular chain disruption. B. Transverse fractures begin at the foramen magnum and extend through the cochlea and labyrinth, involves internal auditory canal, ending in the middle cranial fossa (5-30%), are associated with sensory neural deafness and facial nerve palsy. C. Mixed fractures have elements of both longitudinal and transverse fractures. 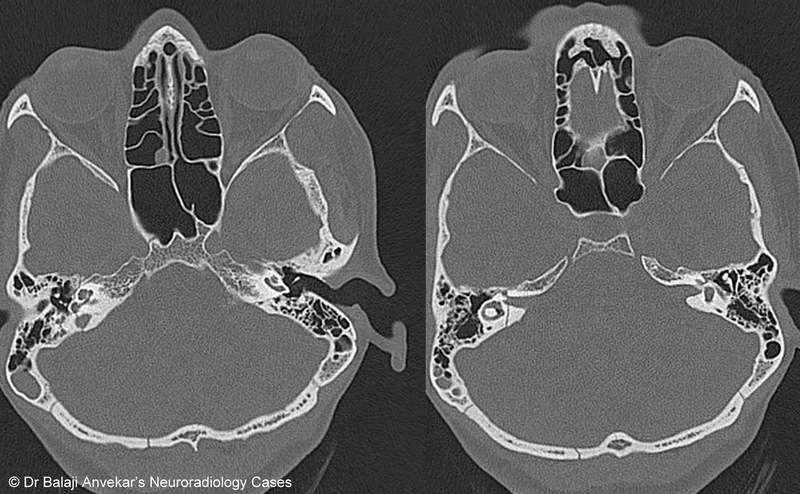 Another classification system of temporal bone fractures has been proposed. This system divides temporal bone fractures into petrous and non petrous fractures; the latter includes fractures that involve mastoid air cells. These fractures do not present with cranial nerve deficits.